If you're as much of a music-lover as I am, the rare occasions in your life in which you can feel good about the amount of money you spend on iTunes are well, rare. Whenever I hear about a benefit album, I am presented with a dilemma because on the one hand; the humanitarian side of me wants to help the world... but the selfish, and lover-of-good-music side of me really can't spend anymore money on music that doesn't satisfy. 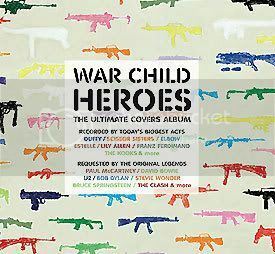 This new War Child: Heroes album is anything but unsatisfactory. The War Child charity works with protecting children in war-torn areas of the world including Congo, Iraq and Uganda. Incorporating a revolutionary idea, this charity asked legendary icons such as Sir Paul McCartney and David Bowie to choose the up-and-coming artists that they wanted to create a new twist on some of their classics; putting faith in the next generation of musicians. This album is such a great listen that each song reminisces of the original tracks and artist while still drawing upon our the sound of our generation's new message of hope. Some highlights of this phenomonal collaborative effort include the covers of The Ramones "Sheena is a Punk-rocker" by the Yeah Yeah Yeahs, and The Hold Steady's take on Brice Springsteen's classic "Atlantic City". This album is a must-buy for anyone who loves music and well, the world.